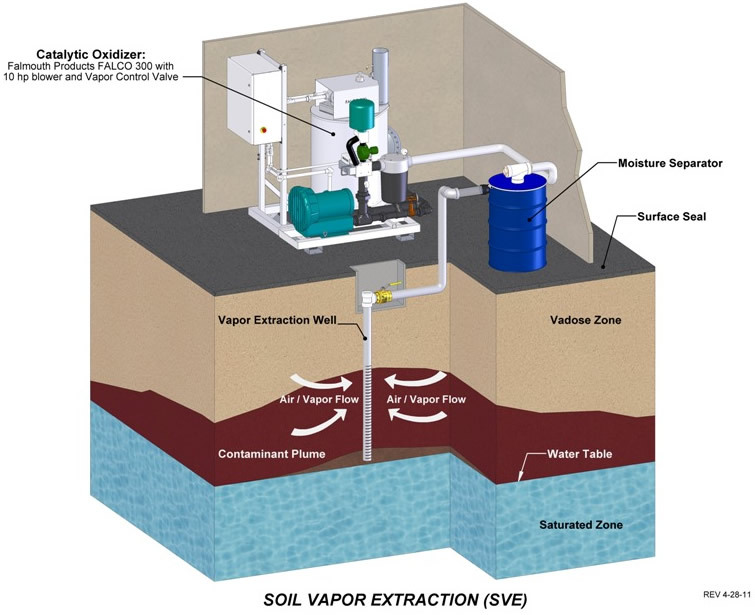 Soil vapor extraction (SVE) is an in situ remediation strategy used to clean up petroleum contaminated soils. An SVE vacuum pump (blower) is used to apply vacuum to vertical or horizontal screened extraction wells installed in or near the contamination source. Air moves through the soil volatilizing contaminants dispersed above the water table. The vapor is pulled into the SVE well and discharged from the blower to a treatment device. For over thirty years, soil vapor extraction has proven to be a successful strategy for removing volatile organic compounds (VOC's) from the soil. SVE is most successful when applied to light (volatile) petroleum products that have leaked into permeable soils with water table depths greater than four feet. The greater the soil permeability, the more easily vapor can be extracted. A surface seal extending over the site helps direct airflow horizontally. When determining optimal SVE well placement, radius of influence is considered. Radius of influence is the maximum distance from an SVE well that still provides sufficient pressure gradient to induce flow of contaminants. The most common soil vapor extraction applications are at underground storage tank sites, usually gasoline stations. This technology is also applied to sites contaminated with Chlorinated Volatile Organic Compounds (CVOC's).